Thousands of Palestinians have turned out for the funerals of dozens of protesters killed by Israeli troops in Gaza yesterday. The number of protesters that gathered at the frontier today was significantly lower than yesterday. It appeared that many had gone to mourning tents rather than back to the scene of the bloodiest day for Palestinians since a 2014 Gaza war. However, local health officials said Israeli forces shot dead two Palestinians near the Gaza-Israel border. 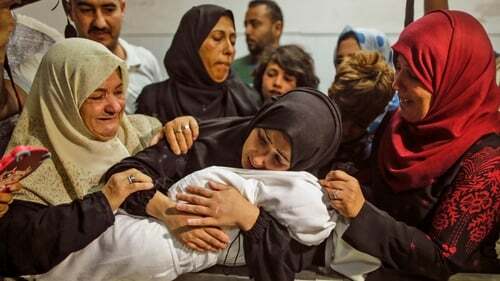 The Palestinian Health Ministry said 60 Palestinians were killed, including an eight-month-old baby that died from tear gas that her family said she inhaled at a protest camp near the border. More than 2,200 Palestinians were also injured by gunfire or tear gas, local medics said. Yesterday's bloodshed took place as the United States opened its new embassy in Jerusalem. For the past six weeks, Palestinians have been holding Gaza border demonstrations for the return of Palestinian refugees to areas that are now part of Israel. Palestinian medical officials say 106 Gazans have now been killed since the start of the protests and nearly 11,000 people wounded, about 3,500 of them hit by live fire. Israeli officials dispute those numbers. No Israeli casualties have been reported. Palestinian leaders have called yesterday's events a massacre, and the Israeli tactic of using live fire against the protesters has drawn worldwide concern and condemnation. The United Nations Security Council met in New York to discuss the situation. The US ambassador to the United Nations said that Israel had acted with restraint in the face of provocation from Hamas. "No country in this chamber would act with more restraint than Israel has," Nikki Haley told the Security Council. "In fact the records of several countries here today suggest they would be much less restrained," she said. Israel has said it was acting in self-defence to defend its borders and communities. Its main ally the United States has backed that stance, with both saying that Hamas, which rules Gaza, instigated the violence, an allegation denied by the militant group opposed to Israel's existence. The Israeli military said at least 24 of those killed were "terrorists with documented terror background" and most of them were active operatives of Hamas. Turkey, a strong critic of Israel's actions in Gaza, told the Israeli ambassador to Ankara to leave, a Turkish foreign ministry source said. Yesterday, Turkey said it was recalling its ambassadors to Tel Aviv and Washington. Palestinian president Mahmoud Abbas has withdrawn his top representative to the US. Husam Zumlot, the head of the Palestine Liberation Organisation's office in Washington, will return home in the coming days. This morning, mourners marched through Gaza, waving Palestinian flags and calling for revenge. Today, 15 May, is traditionally the day Palestinians mark the "Nakba", or Catastrophe, when hundreds of thousands fled or were driven from their homes in violence culminating in war between the newly created Israel and its Arab neighbours in 1948. A senior Israeli commander said that of the 60 Gazans killed yesterday, 14 were carrying out attacks and 14 others were militants. He also said Palestinians protesters were using hundreds of pipe bombs, grenades and fire-bombs. Militants had opened fire on Israeli troops and tried to set off bombs by the fence, he said. In Geneva, the UN human rights office condemned what it called the "appalling deadly violence" by Israeli forces. The UN rapporteur on human rights in the Palestinian territories, Michael Lynk, said Israel's use of force may amount to a war crime. The chief prosecutor of the International Criminal Court has vowed that she was watching closely the unrest in Gaza. Fatou Bensouda said she would "take any action warranted" to prosecute crimes. Elsewhere, a British minister has said the US needs to show greater understanding of the root causes of the Israeli-Palestinian conflict, in a rare criticism of Britain's closest ally. Alistair Burt, minister of state for the Middle East, made the comments during a debate in parliament. "The US will remain a central part of what needs to happen in Israel, but it does need to give a greater sense of understanding of some of the underlying issues," Mr Burt said.